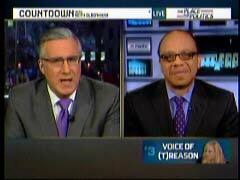 On Tuesday’s Countdown show, MSNBC host Keith Olbermann highlighted suggestions by former Republican Congressman Tom Tancredo that there should be civics literacy testing for registered voters made at the recent Tea Party convention, which Olbermann referred to as the "Tea Klux Klan," and painted Tea Party activists as wanting to deny minorities the right to vote using the tactics of the Jim Crow South. As if Tancredo wanted to discriminate against African-American voters, Olbermann referred to "Tancredo harking back fondly to the electoral strategies once used to keep poor people – specifically, explicitly, black people – from voting." If you ever thought mainstream Republicans would openly reminisce about race-based election stealing, did you ever think that you would, as a grown man in the 21st century, see the once proud Republican party let it happen with the only kind of peep of integrity coming from the daughter of a Senator? Let's be clear, as you pointed out earlier in the program, this is naked Jim Crow racism of the kind that was practiced in this country, especially in the South, not just in the 50s, but for many decades. People died in order that people who look like me would be able to vote without trumped up – facing trumped up literacy tests and poll taxes. And for Tancredo to say what he said is just outrageous, it is a new low, and I am not – you know, the Republican party does have a proud tradition, there are a lot of Republicans who can't possibly believe this stuff. But it is actually a new low in this political year, and that is really quite something for me to say. Today the GOP has plenty of McCarthys, an entire wing of them in the Tea Party. But these days the two Republican Senators from Maine stand by quietly, bearing mute witness apparently unconcerned with what Margaret Chase Smith would think of their silence. And so, we were surprised to discover yesterday that it is instead the daughter of a Republican Senator who seems to have taken up the mantle of Margaret Chase Smith. Her name is Meghan McCain. KEITH OLBERMANN, BEFORE COMMERCIAL BREAK AT 8:24 P.M.: And here’s a television and history tease for you. Who was Margaret Chase Smith? And what does Margaret Chase Smith have to do with the next two segments on Countdown – one of them about the Tea Klux Klan? OLBERMANN, BEFORE COMMERCIAL BREAK: So, for nearly a week, some of us have said if you invoke the literacy voting tests of the Jim Crow South and you disparage voters who can’t speak English, and a crowd roars and cheers and the guy who hired you to give the speech says it was great, the whole lot of you are racists. Now, a prominent Republican has said: Correct. "Innate racism," she says. Next. OLBERMANN, AT 8:32 P.M.: Startling assessment of the state of the GOP from one of its prominent members. It was Maine’s Republican Senator who said, and I’m quoting here: "I don’t want to see the Republican party ride to political victory on the four horsemen of calumny – fear, ignorance, bigotry and smear. I doubt if the Republican party could, simply because I don't believe the American people will uphold any political party that puts political exploitation above national interest. Surely, we Republicans aren't that desperate for victory." Unfortunately for the Republicans, unfortunately for the nation, the Republican Senator who said that, while being from Maine, was Margaret Chase Smith, and she was speaking on June 1, 1950, delivering her historic declaration of conscience, pushing back against the fear and bigotry and smears and ignorance being practiced by her own party – by, in particular, the Wisconsin Republican witch hunter, Senator Joseph McCarthy, we mentioned began all that 60 years ago tonight. Today the GOP has plenty of McCarthys, an entire wing of them in the Tea Party. But these days the two Republican Senators from Maine stand by quietly, bearing mute witness apparently unconcerned with what Margaret Chase Smith would think of their silence. And so, we were surprised to discover yesterday that it is instead the daughter of a Republican Senator who seems to have taken up the mantle of Margaret Chase Smith. Her name is Meghan McCain. Guest hosting The View TV show, she responded to the Tea Party convention’s opening speech by former Republican Congressman Tom Tancredo. And while she might have been cheesed off that Tancredo, in his speech, thanked God that her father did not win, and she might have been cheesed off that an Arizona tea bagger is about to announce his primary challenge to McCain, what she said was that she was cheesed off by Tancredo harking back fondly to the electoral strategies once used to keep poor people – specifically, explicitly, black people – from voting. 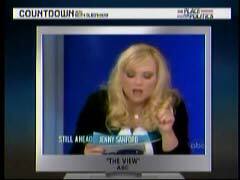 MEGHAN MCCAIN, FROM THE FEBRUARY 8 THE VIEW: Congressman Tancredo went on TV, and he was the first opening speaker, and he said that, "People who could not spell the word vote or say it in English put a committed socialist ideologue in the White House, whose name is Barack Hussein Obama." And then he went on to say that people at the convention should have to pass literacy tests in order to be able to vote in this country, which is the same thing that happened in the 50s to prevent African-Americans from voting. And it’s innate racism. And I think it’s why young people are turned off by this movement. And, I’m sorry, revolutions start with young people, not with 65-year-old people talking about literacy tests and people who can't say the word vote in English. OLBERMANN: Mr. Tancredo, we should note, is still 64. He theoretically has almost a year left in which he is still eligible to start a revolution. You're as young as you feel, Congressman. Joining in with Tancredo’s opening night race baiting and reality-free xenophobia was Joseph Farrah, mastermind – that's the right word for it – of the political world's online Big Foot and aliens tabloid World Net Daily. Farrah trotting out – to Tea Party cheers – the tired old canard of President Obama’s birth place. Quote, "I say if it's been settled, show us the birth certificate. Simple." Here you go, Mr. Farrah. And, yes, simple's the word for it. And, by the way, your own Web site proved it. Time now to turn to MSNBC political analyst Eugene Robinson – also, of course, associate editor, Pulitzer Prize winning columnist of the Washington Post. Gene, thanks for your time tonight. EUGENE ROBINSON, WASHINGTON POST: Good to be here, Keith. OLBERMANN: If you ever thought mainstream Republicans would openly reminisce about race-based election stealing, did you ever think that you would, as a grown man in the 21st century, see the once proud Republican party let it happen with the only kind of peep of integrity coming from the daughter of a Senator? ROBINSON: I hoped not. I mean, let's be clear, as you pointed out earlier in the program, this is naked Jim Crow racism of the kind that was practiced in this country, especially in the South, not just in the 50s, but for many decades. People died in order that people who look like me would be able to vote without trumped up – facing trumped up literacy tests and poll taxes. And for Tancredo to say what he said is just outrageous, it is a new low, and I am not – you know, the Republican party does have a proud tradition, there are a lot of Republicans who can't possibly believe this stuff. But it is actually a new low in this political year, and that is really quite something for me to say. OLBERMANN: Well, is it fear or is it stupidity? I mean, fear of speaking out against this, what this mob means, or is it stupidity because they haven't figured out a way to do it in a way that would benefit their own political aspirations, which would seem to be probably 12 or 15 really easy ways to come out against racism and race and ethnic baiting that might work to your benefit. It's amazing they can't find it. ROBINSON: Well, you know, six of one, half dozen of the other. I go with the profiles in cowardice theory, that they're afraid of offending the racist wing of the party in violation of what I sincerely hope are their own principles. But when asked to question those principles, if they won't stand up for them in the face of something like this. Have we heard even from chairman Steele, for example? OLBERMANN: Meghan McCain is who we have heard from. Now, politically, and practically speaking, is her saying this in that way in that venue, no matter what her other complaints were about Tancredo being sort of family in nature, is that going to cost her father votes in the primary, and, you know, will her father care, and are the forces of good going to defend John McCain, whether they’re Republican or Democratic forces of good? ROBINSON: Arizona's a difficult state to predict. In a real politics sense, you’ve got to say that the racist wing of the party is energized right now, and may be likely to turn out in the primary. You could also point out that Arizona was a state that rejected the idea of a Martin Luther King holiday for a long time. On the other hand, I was out in Scottsdale, Arizona, which is something like the fifth whitest community in the nation, not long ago delivering a speech. They do a really huge and interesting and important Martin Luther King Day celebration every year now, that is bigger and more elaborate than most I've seen in the country. So it's a funny state. I'm not sure that this actually will go over as well as Mr. [J.D.] Hayworth might want it to. ROBINSON: Well, we'll have to see in the fullness of time. Maybe she'll run for the Senate. But it certainly, hers is a voice of conscience and a voice of the future, what I hope would be the future for the Republican party, and clearly the party needs such a voice right now, it is ironic that it – that this voice comes from not from one of the Senators, one of the – or indeed anyone who has any sort of official position in the party. But for Meghan McCain. May she continue to co-host The View as long as she wants. OLBERMANN: And they'll kick her out soon enough. Not The View, the RNC. Gene Robinson, Pulitzer Prize-winning columnist of the Washington Post, as always, a great pleasure, Gene, thank you.